Simply Books! 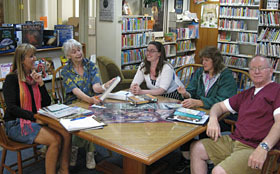 is the library’s book group for adults. The fall season for the book group begins Saturday, September 27, 2014 at 2:00 pm. Simply Books! is a book group designed for book lovers. There’s no set reading list, we don’t all read the same book, and it’s very informal. We simply bring along whatever book we’re currently reading (usually the ones we’re loving and want to talk about! ), and share it with the group. Simply Books! meetings are on the FOURTH Saturday of the month. If you’d like to learn more, please email Marie Stickney at mstickney@librarycamden.org. Or visit the Readers Corner Blog at cplreaderscorner.wordpress.com, and click on the “Simply Books!” page. We welcome everyone and anyone who loves reading and talking about books to join us at Simply Books!